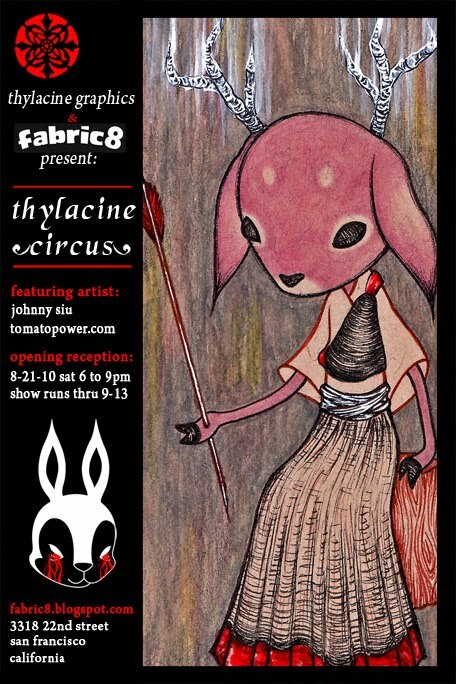 Saturday, August 21,2010 6-9PM was the opening of Thylacine Circus, a solo show by artist Johnny Siu. Siu is a San Francisco illustrator and aesthete who specializes in darkly darling drawings on perfectly-packaged paper or subtly-stained surfaces. He has also decorated the city streets with flowery wheatpastes asking "Where are all my thylacines?" He will be creating an entire collection of small, affordable pieces so be sure to get one before they're gone.